Before Florida was admitted into the United States in 1845, St. Augustine remained mostly under Spanish rule. Maintaining control of the city was not so easy; it was highly sought after by Great Britain as they colonized America. Throughout its Spanish period, St. Augustine was invaded by the British, raided by pirates, and burnt down twice! The diverse cultural heritage of St. Augustine has made it a popular tourist destination for travelers around the world. The best way to fully understand the city’s unique character is to experience it yourself. When you stay in any of our St. Augustine accommodations, you will be close a wide array of fun things to do in St. Augustine. Our guests appreciate the Old World romance and scenic beauty that abounds here. Whether you are interested in relaxing on the beautiful beaches, shopping downtown or at the many outlet malls, going on a tour of the city, or eating at one of the many restaurants near our Inn, we guarantee you’ll find countless things to do in St. Augustine. For even more fun things to do in St. Augustine, download our free Vacation Guide. If you feel like there’s so much to see and not enough time, consider taking one of the many tours around town! Tours are a great way to learn about the history of St. Augustine from the people who know it best. Old Town Trolley Tour: Without a doubt, this is one of the most popular tours in town. If you purchase your ticket directly from Agustin Inn, you’ll have the option to get a three-day ticket, rather than just a one-day ticket. This hop-on, hop-off tour goes to 23 stops, which you can preview on their website. Tour by Horseback: Arrange a romantic carriage tour of the city when you book your room at Agustin Inn! 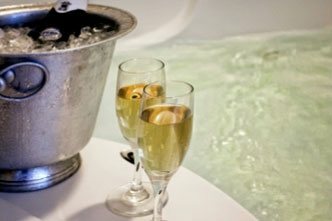 It’s part of our Ultimate Romance Package and our Agustin Classic Romance Package. If you’re feeling brave enough, you shouldn’t miss one of the best things to do in St. Augustine at night: take an after-dark tour of the city! Historic Pub Crawl: This one-of-a-kind tour includes stops at some of the best bars around town as you learn about old Spanish and English drinking customs and the history of the city. Ghost & Gravestones Riding Ghost Tour: Take a ghost trolley tour to the most haunted sites in St. Augustine! Ripley’s Ghost Train Adventure: Ripley’s Believe it or Not in St. Augustine offers a ghost train tour that is not to be missed! Sunset Sail: There’s no better way to spend a romantic getaway in town than by taking the Schooner Freedom Sunset Sail. Include this as an add-on attraction when you book with Agustin Inn! It should come as no surprise that the Nation’s Oldest City is home to many fascinating and educational museums and historic sites. Best of all, many of these sites are just a short walk from Agustin Inn. 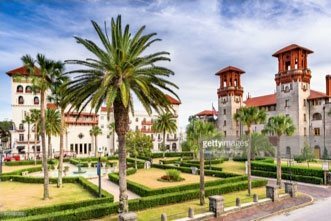 Here are some of our picks for the best historic houses, sites, and museums in St. Augustine, FL. 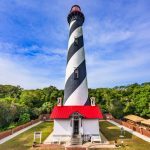 St. Augustine Lighthouse and Maritime Museum: explore the grounds and climb to the top of this mid-19th-century lighthouse. Check out the various tours available to visitors! Castillo de San Marcos National Monument: This historic site is one of only two fortifications in the world constructed out of coquina. Walk the stone walls, watch a weapons demonstration, and learn how this structure once protected St. Augustine! Spanish Military Hospital Museum: Did you know that the Spanish settlers in St. Augustine had an impressively advanced medical care? They even had an early form of vaccinations! The Spanish Military Hospital Museum is a living history site that shows you the building just as it was in 1791. St. Augustine History Museum: If you’re looking for an overview of St. Augustine’s almost 400 years, visit this museum! From the founding of the city in 1565 to Henry Flagler’s legacy, you’ll learn it all. Fort Matanzas: Originally built in 1742, this historic site is one of the best free things to do in St. Augustine! Colonial Quarter: This is another excellent living history museum, with live weapons demonstrations and an onsite blacksmith. Gonzalez Alvarez House: Said to be the oldest house in St. Augustine, the Gonzalez Alvarez House was built in 1723. Today, visitors can tour the property, as well as other interesting sites on the Oldest House Museum Complex. The Old Jail Museum: Sometimes called Old St. Johns County Jail, this living history museum provides tours that show visitors how life was for prisoners in the late 19th and early 20th century. Ximenez-Fatio House: Built in 1798, the Ximenez-Fatio House is one of the best-preserved and most authentic representations of St. Augustine in the 18th and 19th centuries. Villa Zorayda Museum: You won’t want to miss touring one of the most beautiful buildings in St. Augustine! It was designed after Alhambra, a Morrish palace in Granada. Mission of Nombre de Dios: This is the site of the first mission established by Spanish settlers. Today, it features a museum as well as The Great Cross that towers over the city at 208 feet. Lightner Museum: The Lightner Museum displays the personal collection of Otto C. Lightner. Inside, you’ll find artwork, antiques, and other curios from many auctions over the years. If you’re traveling with kids 12 and up, consider stopping by these exciting attractions! Potter’s Wax Museum: Did you know that St. Augustine is home to America’s oldest wax museum? It’s true! Potter’s Wax Museum was founded in 1948 by George Potter. Today, visitors can take a picture with the wax models of historic figures, celebrities, athletes, and more. St. Augustine Alligator Farm Zoological Park: The St. Augustine Alligator Farm Zoological Park is the only facility in the world with all 24 currently recognized species of crocodilian! They also house lemurs, native bird species, and many more exotic creatures. Be sure to try Crocodile Crossing, their zip line obstacle course that gives you an amazing view of the park. Ripley’s Believe it or Not: Do you believe? Check out the bizarre exhibits at this famous attraction. In total, there are more than 800 things to see. Best of all, it’s just a six-minute walk from Agustin Inn! St. Augustine Wild Reserve: Take a walk on the wild side when you visit the St. Augustine Wild Reserve. Tours of the facility are available every Monday, Wednesday, and Saturday at 2:00 p.m. Be sure to plan ahead, as you’ll need an appointment. Spanish Bakery & Cafe: Don’t be surprised if you get drawn in by the smell of freshly baked pastries! Spanish Bakery & Cafe is serving classic Spanish soups, sandwiches, and salads, plus a selection of freshly baked treats! This St. George Street spot is less than a block from Agustin Inn. Cafe Alcazar: Located in the Lightner Museum, Cafe Alcazar specializes in creating unique dishes with fresh and local ingredients. Reservations are recommended. Cafe Alcazar is a 10-minute walk from Agustin Inn. Mi Casa Cafe: Part beer and wine garden, part lunchtime cafe, you’ll enjoy the selection of Cuban and Reuben sandwiches, salads, and more on their menu! Best of all, they’re right next door to Agustin Inn! Michael’s Tasting Room: Our next-door neighbor in downtown St. Augustine is serving up incredible seasonal Latin-inspired cuisine. Michael’s Tasting Room takes advantage of the array of wonderful local ingredients to create elegant food. Combine that with their amazing wine and beer list and their friendly service, and you’ve got the perfect date night spot! Cellar 6: What started as a wine bar with sophisticated tapas has transformed into one of the only restaurants featuring urban cuisine in the city. Check out their happy hour specials and their creative drink menu, and be sure to save room for dessert! Cellar 6 is a seven-minute walk from Agustin Inn. Prohibition Kitchen: Travel back to the classic prohibition era when you visit this hip St. Augustine restaurant! Their menu includes some southern classics as well as some traditional gastropub fare. Add to that their handspun milkshakes and cast iron desserts, and you’ve got an outstanding meal! Prohibition Kitchen is located on St. George Street, less than two blocks from Agustin Inn. The Floridian: Their motto says it all! They make “innovative southern fare for omnivores, herbivores, and locavores.” You’ll find everything from down-home comfort foods to lighter vegetarian options. The menu is seasonally inspired and utilizes local and sustainable ingredients when possible. The Floridian is just a four-minute walk from Agustin Inn. Collage: For the ultimate fine-dining experience, reserve a table at Collage. The owners, Mike Hyatt and Cindy Stangby, “focus on fresh, local seafood, steaks, lamb, and veal, using international flavor profiles.” Their amazing wine list has been meticulously chosen. You’ll be impressed by their attention to detail here! Collage is a three-minute walk from Agustin Inn. 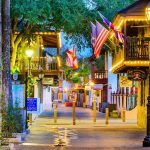 Columbia Restaurant: Visit the oldest restaurant in Florida! Columbia has more than a century of experience serving up classic Spanish and Cuban cuisine. Their St. Augustine location is on St. George Street, about a two-minute walk from Agustin Inn. Sunset Grille: This local hotspot is serving up award-winning food! There’s nothing better after a day at the beach than digging into a bowl of their chowder or a plate of their baby back ribs. Check out their drink menu too! Sunset Grille is located off St. Augustine Beach. Beaches at Vilano: If you’re spending a day at Vilano Beach, be sure to stop by this waterfront restaurant. You’ll find everything from conch fritters to fried gator on their menu. Save room for their fried cheesecake or key lime pie! The Corner Bar: While not a beachfront spot, this classic sports bar is close enough to the shoreline to count! They have a comedy show every Friday and Saturday night, as well as 10 satellite TVs, a daily special, and a wide drink selection. Cap’s on the Water: Take in the stunning view from Cap’s on the Water while you enjoy their menu of classic southern and Mediterranean flavors. Their seasonal menu takes advantage of the great local seafood and their world-class wine list pairs perfectly with the selection! O.C. White’s Seafood and Spirits: This beachfront restaurant is a St. Augustine staple. 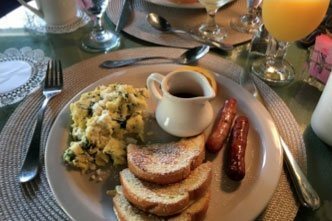 With a wide selection of soups, salads, seafood, and more, plus a Sunday brunch, no trip to St. Augustine is complete without a visit. Planet! Sarbez! : This eclectic late-night hotspot is the perfect hangout. Enjoy their menu of innovative grilled cheese sandwiches and awesome drink selection. Ice Plant Bar: They’ve got good food and drink down to a science at the Ice Plant Bar! Their farm-to-table menu was inspired by the early 20th century and features grass-fed burgers, local seafood, and some awesome vegetarian options. Their drink menu includes fresh, house-pressed juices and specially developed syrups. Ice Plant Bar is a five-minute drive from Agustin Inn. St. Augustine Distillery: Enjoy the selection of bourbon, vodka, gin, and rum at the St. Augustine Distillery. Take a tour of the facility or sample of the amazing goods. There’s also a retail shop in the facility, so you can take your favorites home with you. Head to St. George Street, a pedestrian-only thoroughfare located just a short walk from Agustin Inn, to enjoy hours of shopping! You never know what you’ll find at these boutiques and stores. Here are a couple of our picks for St. George Street shops. The Pirate Store: If the pirate’s life is for you, visit The Pirate Store! It has all the best replica weapons, as well as clothing and jewelry and other fun gifts. It’s just a four-minute walk from Agustin Inn. Spanish Dutch Convoy: For gorgeous leather goods, head to Spanish Dutch Convey. They’re a couple of steps from our front steps! Faux Paws: Your four-legged friend needs a gift too! Stop by Faux Paws to buy something special for your dog. They’re down the block from Agustin Inn. Shopaholic Boutique, Inc.: This cute store offers some of the best women’s clothing in town. Pick up your new favorite outfit during your trip! They’re just around the corner from Agustin Inn. Red Pineapple Boutique: If you’re looking for decor or a cute gift, head to Red Pineapple Boutique! They are just a three-minute walk from Agustin Inn. Sunburst Trading Company: Founded in 1979, Sunburst Trading Company sells gorgeous gifts, accessories, and jewelry from all over the world. It’s just a four-minute walk from Agustin Inn. St. Augustine isn’t just known for its fascinating history. It’s also known for its gorgeous beaches! St. Augustine Beach: Without a doubt, this is the most popular beach around. It’s located on Anastasia Island and features awesome shops and restaurants nearby. Vilano Beach: This stretch of shoreline is preferred by many locals. 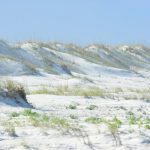 It’s quieter than St. Augustine Beach and features a heavier surf and stronger current. There are plenty of fantastic St. Augustine bike rentals that let you get moving quickly! 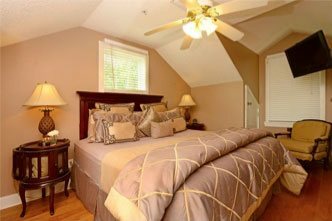 Solano Cycle: Located less than a half-mile from Agustin Inn, Solano Cycle offers deals on 24-hour, overnight, and weekly rentals. St. Augustine Bike Rentals: If you’re interested in biking the historic district of St. Augustine, rent from St. Augustine Bike Rentals. Here, you can rent by the hour or by the day. They also provide guided two-hour tours in English and Spanish. Island Life: If you want to ride on the shoreline, stop by Island Life to get a beach cruiser bike. They also rent beach accessories, tandem bikes, hybrid bikes, fat tire bikes, and so much more. They offer packages that let you make the most of your St. Augustine getaway. If you’re looking for the perfect place to enjoy hiking, biking, and beach fun, all in one gorgeous location, visit Anastasia State Park. It features four miles of beautiful beaches, marshes, and hammock preserves. You can rent a paddleboard for some beach time fun or rent a kayak or canoe and explore Salt Run, the estuarine tidal marsh. Bicycles are also available to rent here. Check out the Ancient Dunes Nature Trail, a loop that is ideal for visitors who would like to take an easy walk. Stop by the Coquina Quarry while you’re here. This archeological site was once the place that housed the very coquina rocks used to build the Castillo de San Marcos! Enjoy St. Augustine on a budget! Here are some of our suggestions for free things to do in St. Augustine. 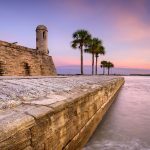 Explore Fort Matanzas! Yes, one of our favorite historic sites is free to visit. San Sebastian Winery and St. Augustine Distillery both offer free tours. Enjoy the many St. Augustine events, like Music by the Sea, First Friday Art Walk, or Concerts in the Plaza. Are you looking the best places to eat in St. Augustine? Or do you want suggestions for our favorite free things to do in St. Augustine? Check out our blog! It’s a fantastic resource for first-time visitors to the area. Learn everything you need to know about the Nation’s Oldest City! Are you looking for things to do in St. Augustine this weekend? Follow us on Facebook!